Walter Kirn (born August 3, 1962) is an American novelist, literary critic, and essayist. He is the author of eight books, most notably Up in the Air, which was made into a film of the same name starring George Clooney. As a writer, he has published a collection of short stories and several novels, including Thumbsucker, which was made into a 2005 film featuring Keanu Reeves and Vince Vaughn; Up in the Air, which was made into a 2009 film directed by Jason Reitman; and Mission to America. The film adaptation of Up In The Air, which starred George Clooney and Anna Kendrick, was a commercial success and went on to receive critical acclaim as well as numerous nominations and awards. In 2005, he took over blogger Andrew Sullivan's publication for a few weeks while Sullivan was on vacation. He has also written The Unbinding, an Internet-only novel that was published in Slate magazine. His most recent work, Blood Will Out, is a personalized account of his relationship with the convicted murderer and imposter Clark Rockefeller. 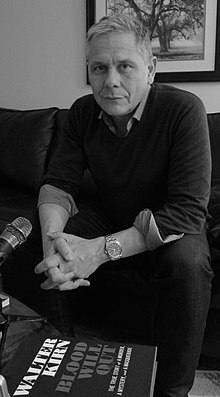 He has also reviewed books for New York Magazine and has written for The New York Times Book Review and New York Times Sunday Magazine, and is a contributing editor of Time, where he has received popularity for his entertaining and sometimes humorous first-person essays among other articles of interest. He also served as an American cultural correspondent for the BBC. In addition to teaching nonfiction writing at the University of Montana, Kirn was the 2008–09 Vare Nonfiction Writer in Residence at the University of Chicago. In 1983, he graduated from Princeton University with a B.A. in English. Following that, he obtained a second undergraduate degree in English Literature at Oxford University, where he was a Keasbey Scholar. Kirn was born in Akron, Ohio but grew up in Marine on St. Croix, Minnesota. After high school, he attended Macalester College for one year before transferring to Princeton University. Kirn's family joined The Church of Jesus Christ of Latter-day Saints when he was twelve, but Kirn is no longer affiliated with the church. In 1995, Kirn married Maggie McGuane, daughter of actress Margot Kidder and novelist Thomas McGuane. Kirn was 32 at the time; McGuane was 19. The couple had two children but have since divorced. Kirn is now married to magazine writer Amanda Fortini. The two split their time between Livingston, Montana and Los Angeles, California. ^ "Walter Kirn". Mormon Literature Database. Brigham Young University. c. 2003. Retrieved June 30, 2010. ^ "The Unbinding: An exclusive Slate novel. By Walter Kim". Slate. Retrieved 2006-06-22. ^ "Walter Kirn". Retrieved 2014-11-22. ^ Kirn, Walter (2005-01-05). "Lost in the Meritocracy". The Atlantic. Retrieved 2014-07-20. ^ Brozan, Nadine (1995-08-16). "Chronicle". The New York Times. Retrieved 2010-05-27. ^ Kirn, Walter (1990). My Hard Bargain: Stories. New York: Knopf.